Inspiration for a baby shower theme can come from just about anywhere. During spring time, it seems that fresh grass, flower buds, and babies are popping up and out all over the place. More babies being born means more baby showers to throw. In keeping with the “popping” idea, a witty baby shower theme idea that coordinates is the “she’s about to pop” theme. It’s versatile and can easily be adapted for a boy or girl. Plus invitations, decorations, and dessert table styling can incorporate all sorts of fun colors. For an especially clever twist, give the shower a pop art flair. Just as pop art applauds popular cultural images, a “she’s going to pop” baby shower celebrates the contemporary mama-to-be. 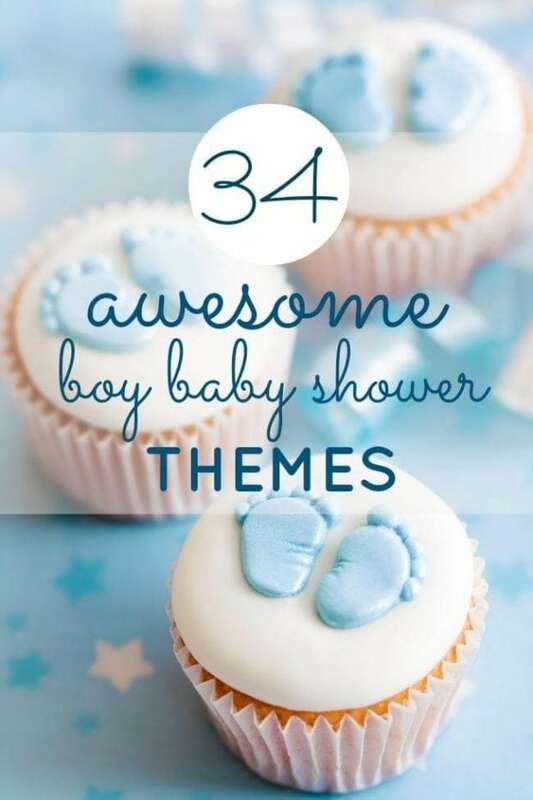 Come check out the ideas and see how you’d rate this creative baby shower theme. Check out A Modern World Traveler Themed Baby Shower for amazing details perfect for showering the mom-to-be. You wont want to miss out on this Romantic Lullaby and Goodnight Baby Shower. Often when planning a baby shower, a well-designed invitation can inspire a great theme and/or even the décor choices. This was definitely the case for this shower theme. The cute pop art style the She’s gonna POP! invitation was a great foundation for building a fantastic baby shower. 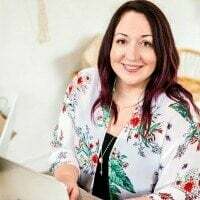 Reminiscent of vintage style comic books with striking graphics and a visually appealing mix of stripes and dots, it set a fun and modern vibe for the event. It instantly infused a surge of energy to the party atmosphere from the instant guests received the invitations. Weaving the pop art style from the invitation design into the baby shower decorations instantly infused a surge of energy and sophisticated playfulness into the party atmosphere. For an intimate-style gathering such as this (of special friends and family at home), decoration efforts can be focused on the main buffet, dessert table, and beverage station. For this baby shower, an aqua dotted backdrop that screams “pop art” was used as the focal point for the dessert table. Combined with the busy patterns and vibrant colors of the desserts and refreshments, the divergent look was effective and definitely made a big artistic statement. While a mix of colors and patterns are used throughout the styling of this dessert table, repetition of the leading colors pulls everything together for a cohesive, coordinated look. Using the rule of 3, this tabletop was decorated consciously trying to incorporate a prominent color in at least three places. For example, aqua is a strong color player in this party plan. You’ll notice the aqua color is incorporated into the table design in several places from the backdrop to the stripes on the popcorn boxes to the candy, and even a smidgeon of it on the soup cans. You’ll notice yellow is incorporated in a similar fashion and can be seen on the bananas, the “Pop!” cake topper, the cheery flower display, and the candy. Fresh flowers are a great addition to just about any event. They add a touch of loveliness and sophistication that is hard to achieve in any other way. To incorporate flowers into this baby shower and also carry through the pop art motif, the creativity was in the way the flowers were displayed. Using recycled Campbell’s Soup cans as vases was pure genius! What a great nod to the king of pop art, Andy Warhol, who famously used Campbell’s Soup cans in his screenprinting. Lined in a row, 5 vases full of bright, cheery, yellow flowers were displayed on a riser covered in giant dots. A large printable comic book style “Pop” speech bubble was used to help play up the party theme and was the perfect pop art-inspired addition to a simple white cake. Keeping the cake white helped the cake stand out prominently from the busyness of the dotted background and also kept it from competing with the colorful “Pop!” sign. Displayed on a black and white polka dotted platform gave an extra measure of dimension to the styling. Displayed on a modern yellow tray at the base of the cake were a variety of other fun, playful desserts and refreshments. Purple lip-shaped sugar cookies were standouts against the brightness of the yellow tray. Cream covered peanut butter cupcakes displayed in both black and polka-dotted baking cups were topped with red, gummy candy lips and colorful gumballs were another great dessert option. Doesn’t the contrast of bright colors with the accent of black make everything look more vibrant? We think the striped treat cups full of gumballs are an especially whimsical treat, perfect for a party celebrating a new child on the way. Bananas may seem like an odd choice on this table until you recognize them as another nod to Warhol’s pop art style. Plus, they make a great healthy alternative to all the sweets. 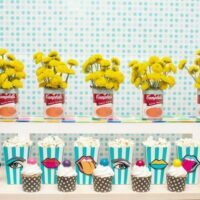 The aqua striped boxes of popcorn are another healthier option, and look particularly appropriate for the “she’s going to pop party’ with printed pop art graphics adhered to the fronts of each box. Why don’t you try your hand styling a pop art inspired “she’s going to pop” baby shower! You can try out the peanut butter cupcake recipe from this party post while you plan! 2. Cream butter, peanut butter and sugar. 3. Beat in eggs, one at a time. 4. Turn on blender to stir and add vanilla. 5. Sift flour and baking powder, gradually add into mixture. 6. Add milk and blend on low only until well mixed, do not over mix. 7. Bake for 20 minutes or until cupcakes are fully cooked in the middle. 8. Top with your favorite frosting. 9. Makes 12 small cupcake—the perfect size to pop in your mouth! Check out more great baby shower ideas. Great ideas! Love the bold colours and the fun cupcake toppings! The cupcakes are simply delicious.